We had a wonderful community camp and retreat at Mount Vernon, WA, this past week. We now have videos of the early morning meditations from the retreat available on our Teachings page. Our thanks to Shams Scott, Akbar Miller, and Rising Tide International for live-streaming and posting these. Hello Dear Ones, I found this really uplifting and hope you do also. http://america.aljazeera.com/features/2014/6/the-female-sufi-mysticsofgeorgiaspankisigorge.html. Akbar Richard Corlett, long-time Northwest Regional Representative and senior teacher for SOI, died peacefully Wednesday morning, June 4, at 4:45 AM after a long illness. Even during his last months, Akbar was a warm, calming, loving presence to his caregivers and fellow patients. He brought joy and peace to many over the years while leading classes and participating in seminars. He is survived by his two daughters, Sarah and Susanne, son, Mathew, and grandson, Richie. Sarah welcomes phone calls at (425) 829-3647. Please share and enjoy remembrances of Akbar Richard on the Sufi Remembrance Project site. Information about his memorial service will be shared when available. The church up the street from my house opened up the Lake City Emergency Winter Shelter in early December, just when the weather dropped below freezing. 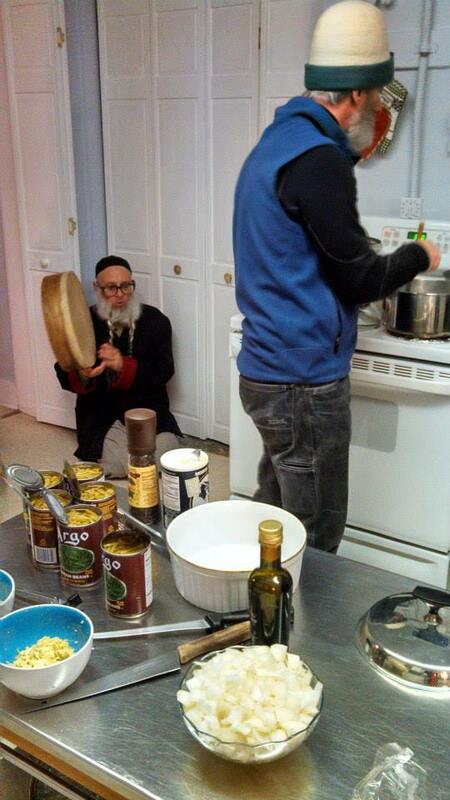 I got to know some of the residents there, and when they needed a Christmas cook, I signed up, and announced the project at the annual Sufi Order Int’l Winter Solstice party, looking for cooks. Suddenly, people wanted to put in money and time. It was like all those centuries of Sufis feeding people in dozens of places came to fruition, and we decided to celebrate the saints and founders of our various orders by offering prayers as we cooked. The Langar Project was born. See the preparation of langar, food given to the poor at a festival, at the tomb of Moinuddin Chishti in Ajmer, Rajasthan, India. Over the four months that the Lake City Emergency Winter Shelter was operating, we cooked Christmas dinner with food provided by Union Gospel Mission, and nine more meals, funded by six individual donors and the proceeds of the women’s zikr night. With almost $500 to spend in such a short amount of time, I knew I couldn’t do all the cooking, and different groups took on cooking and serving. I am grateful to Angelika, Sequoyah, Kai’l, Hanifah, and Azra, for coordinating cooking nights, to Manal, for all the publicity work, and to all the many cooks, drivers, servers, and donors. The Lake City Emergency Winter Shelter is closed for the season, but we got hooked. Angelika cooks every week for God’s Li’l Acre, a refuge that the Seattle Mennonite Church offers from 9 to noon Monday through Friday. Neighbors who live outdoors or in marginal housing come by and use the kitchen, share food, get showers, do a load of laundry, store stuff, get a cup of hot coffee, and talk to folks. For this next run, we’ve received $400 cash and $40 in a Trader Joe’s card from two individual donors, and $400 from the Rifa’i Seattle Sufi community. We’ve been given the use of a 4′ x 10′ raised bed to plant some fresh vegetables, too, so some of the cash will go into plant starts. If you have ideas for how we might further serve the community at God’s Li’l Acre, let me know here. I’ll post a wish list as soon as I get one from the community. Eight minutes. That’s how long it took to make a gift to the Sufis that keeps on giving. I’d heard of this dream, of “the gathering place” for Seattle Sufis, some months ago. I had read about it on this very web site, under the “Participate” menu. I‘d also heard of Sufi centers who already had such a place. I love the idea of creating a central physical place for our classes, music and events, and seeing the energy and goodwill build in the place, week after week, year after year. I don’t own a building to donate to the order. The only real estate I’m involved with is my house, and it has a mortgage payment. Aha: monthly payments are exactly what SOI-Seattle needs, to maintain a physical center (unless someone who does own a building decides to give it to us, that is!) In the meantime, a few of us feel strongly about making the gathering place a reality, so we make monthly donations. They say, “Many hands make light work,” and “What we can’t do alone, we can do together.” The same is true for supporting a central place for our classes and events. When enough people are giving monthly, we’ll know it’s time to get our space. I knew my gifts would be tax deductible. And besides, I’m the treasurer of the organization, so I was supposed to be setting a good example! It’s easy to make a recurring donation on the web site through PayPal. That’s a good way to go, because it’s easy to give without remembering each month. But I didn’t do that; I chose online bill pay. Why? The answer is: the 3% fee PayPal charges the Order each time I give with my credit card. Don’t get me wrong, the Order loves to get donations through PayPal! As Shahabuddin once said, “97% of something is better than 100% of nothing,” but I figured 100% of something is even better. Here’s where the eight minutes comes in! First, I logged in to my credit union’s online bill pay. Next, I created a new payee, SOI-Seattle, P.O. Box 30082, Seattle, WA 98113. Then, I chose to pay this payee once every month, for my monthly donation amount. This goes directly to the Order, for maximum benefit. Lastly, I scheduled a one-time payment, for my monthly donation amount times 12. The reason I did that, was because I’d been procrastinating making my monthly payments for about a year, and I wanted to make up for that! The feeling of satisfaction I have, knowing I’m supporting the effort toward a gathering place each month, has me sleeping like a baby at night. Will you please join me in helping make this dream of our gathering place a reality, by setting up your own monthly donation today? You’ll be glad you did! With enough people chipping in each month, we’ll have a gathering place before we know it. I look forward to seeing you on the path, and at the gathering place.